Updated on 08/10/2012: The correct vegetable name was guessed in the comments within 6 hours. This is a Cylindra Beet, also called Formanova Beet. When I checked our site this morning there were four comments awaiting moderation which all had the correct answer. Wow! Some of you really know your beet cultivars! We’ve grown beets for the last 4 years, but this is our first year growing Cylindra. Cylindra has a number of advantages which make it our new favorite beet variety. First, it’s just funny seeing those beet columns rise from the surrounding soil. Weird vegetables make hand-watering more fun. 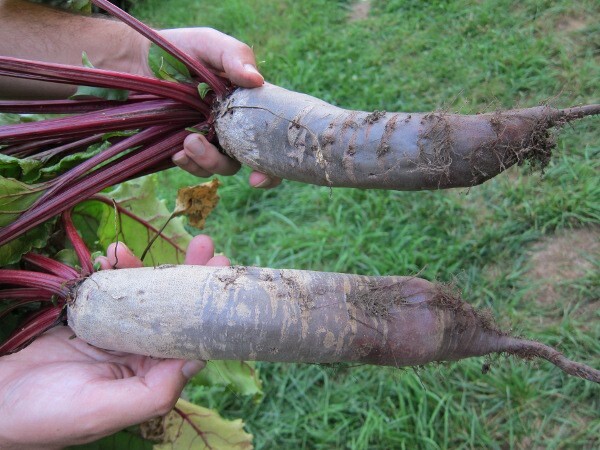 Since only the small tip of the beet is underground, it’s easy to pick. The shape makes it easy to peel and slice. Each slice has the same diameter. It’s almost immune to root maggots. Root maggots are an Oregon pest that hatches at the ground level and chews tracks down the sides of turnips, parsnips, beets, and so forth. Most importantly, the root and greens are both very tasty. We found Cylindra seed at Baker Creek Heirloom Seeds. Nope, although I can see the similarity. … and turned into borscht. Correct, it’s a beet. It’s not one of the “normal” varieties though, so I wonder if someone can also guess the cultivar. I know that one (I think) – is it Cylindra ? … every holiday is not complete without the pickled beets. Correct! Wow, good guess. This is the first time we grew Cylindra and we are really impressed with it, beyond its bizarre appearance. Is it the Formanova beet? Also correct! I wasn’t actually aware that it had a second name until I was looking up Cylindra online to make this post. Answering with the intonation of a question? 🙂 Yup, 3rd correct answer. What is a Formanova beet. …good, a beet. I thought you might have started growing human feet. And the ankles are showing? Well, it’s definitely a beet, but that’s as far as I go. Well, that’s probably closer than most Americans would get. Grocery store beets are the more traditional spheroid shape and always look so neglected. Well, after it’s pulled from the ground it looks almost exactly the same, since most of the beet is above ground while it’s growing. I’ve updated the post with a picture of the harvested vegetable. They are very good and quite sweet. We’ve been eating them instead of the normal crop, so I should pull one of each and do a direct comparison. They would certainly be easier to handle for canning. That is what we were thinking too. Good lord, that’s a big beet. I guess we grew boringly round ones, only. Yeah, I’m also impressed by the size compared to our round ones. Although, some mangels can reach 20 lbs. That would be truly huge! Nice beets! We have real trouble with root vegetables here, but I want to try those. They look like the demon spawn of a horseradish and a regular beet. They were fun to grow. Mostly I just ignored them. Do you have root maggots too or is it more the soil problem you have been dealing with?